Everybody loves doughnuts. Even people who say, "I don't really like doughnuts, actually" are liars and like doughnuts. But who's responsible for the doughnut? Legend(/Wikipedia) has it that the doughnut was invented in North America by a Dutch settler aboard a lime-trading ship (so we've got it narrowed down to North America). Now in North America alone, LA is clearly all about them, Chicago is clearly all about eating them, NYC is all about mocking Chicago for being all about eating them, and Boston has Dunkin'. So who gets the credit? Well, from what we learned at the "Keep Your Eye Upon the Donut" exhibit (which is open 'til March 2nd at the City Reliquary), it's NYC, mostly because we did more for that glorious fried-dough ring than anywhere else. As proof, we've decided to back that up with an excellent donut crawl 13 examples of historic doughnut contributions from our fair city. 1. In 1673, the first doughnut shop in the United States was opened by a Dutch woman named Mrs. Anna Joralemon, on Broadway (near Maiden Lane) in New York City. When you do something that awesome, you'll get a street named after you, just like Mrs. Joralemon. And though they may make you sleepy, they'll never make you hollow (wordplay bonus, +1). 3. In the 1920s, the doughnut was the first food many new immigrants arriving at Ellis Island tasted, thanks to the Salvation Army, who distributed them there as part of their outreach services. Side note: why isn't that still a thing? And would they ever consider doing it in, say, Soho? 4. In 1920, Adolph Levitt, owner of a Harlem bakery, built a successful, automatic doughnut machine, which he called, “The Wonderful Almost-Human Automatic Doughnut Machine”. He placed the machine in his bakery’s window, creating the first version of “donut theater” in the United States. 5. In 1922, Levitt developed the first doughnut mix that could be used in his automatic dougnut machines, making it easy for anyone to make them. Well, sorta easy. Seriously, making donuts is mad hard. 6. In 1931, Levitt opened the first Mayflower Donuts shop in Times Square. Then, additional Mayflower Donut shops opened in cities across the United States, making it the first doughnut shop chain in the United States. Levitt was a great man. 7. 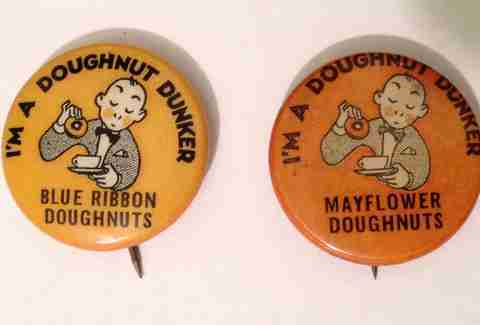 In the 1930s, the National Dunking Association of America, which permitted members to dunk doughnuts at all times in public or private, was started by NOT Dominique Wilkins. Its headquarters were at 152 West 42nd St, and it reportedly had 3mm members at one point. 8. During the 1939 New York World’s Fair, the Doughnut Corporation of America celebrated the first National Doughnut Week. This later led to America's first-ever "slow clap". 9. 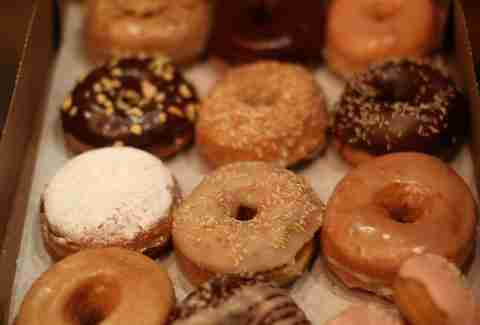 Manhattan was home to the Doughnut Corporation’s five-floor doughnut research & development laboratory. It opened in 1949 at 42 Stone St in Manhattan, and was likely the best place to work of all time. 10. 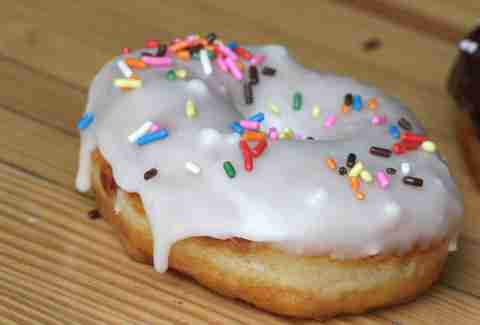 In 1988, the classic doughnut began to be redefined. The Cupcake Café (located at 39th St and 9th Ave) started making doughnuts, and offered six varieties, including glazed, wheat, and orange. 11. In 1994, Mark Isreal, founder of Doughnut Plant, began experimenting with doughnuts in the basement of a Lower East Side tenement. His innovative varieties and use of fresh, seasonal fruit/roasted nuts led the gourmet turn in doughnut-making. 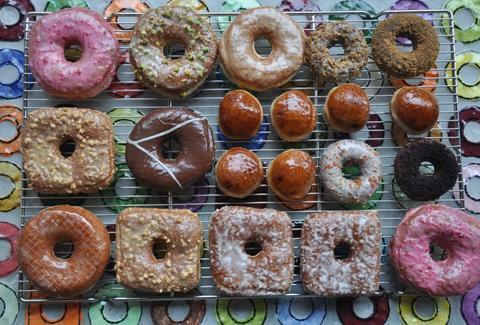 In 2000, the first Doughnut Plant shop opened at 379 Grand St. Then, in 2011, was followed by its shop on the ground floor of the Chelsea Hotel. 12. In 2012, the city’s doughnuts got their own map when the New York Doughnut Map was published by All You Can Eat Press. This was followed shortly thereafter by America's second-ever "slow clap". 13. 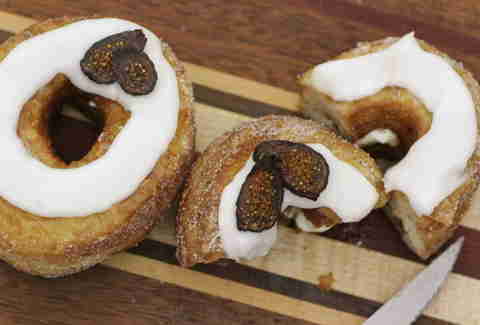 On May 10, 2013, New York City made headlines with the evolutionary doughnut-hybrid, the Cronut™. Invented by Dominique Ansel Bakery, these things were/are so delicious, people have been known to wait for hours for them and imitate them all over the world. Get your own dessert genius, other cities! Andrew Zimmer is Thrillist's NYC Editor. He loves eating doughnuts, the smell of doughnuts, and doughnut trivia. You can follow him (most likely doing something doughnut-related) on Twitter, Facebook, and Instagram.